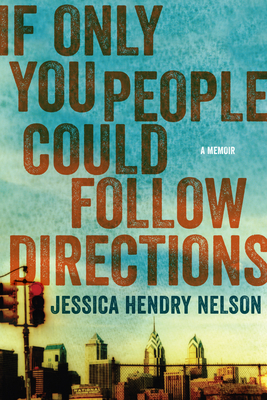 If Only You People Could Follow Directions is a spellbinding debut by Jessica Hendry Nelson. In linked autobiographical essays, Nelson has reimagined the memoir with her thoroughly original voice, fearless writing, and hypnotic storytelling. At its center, the book is the story of three people: Nelson's mother Susan, her brother Eric, and Jessica herself. These three characters are deeply bound to one another, not just by the usual ties of blood and family, but also by a mother's drive to keep her children safe in the midst of chaos. The book begins with Nelson's childhood in the suburbs of Philadelphia and chronicles her father's addiction and death, her brother's battle with drugs and mental illness, her own efforts to find and maintain stability, and her mother's exquisite power, grief, and self-destruction in the face of such a complicated family dynamic. Each chapter in the book contends with a different relationship--friends, lovers, and strangers are all play--but at its heart the book is about family, the ties that bind and enrich and betray us, and how one young woman sought to survive and rise above her surroundings. Jessica Hendry Nelson earned a BA in English from the University of New Hampshire and an MFA in Writing from Sarah Lawrence College. Her work has been published or is forthcoming in The Threepenny Review, The Carolina Quarterly, Crab Orchard Review, Painted Bride Quarterly, Drunken Boat, Alligator Juniper, Fringe, and PANK. A chapter from this book, "The Whitest Winter Light," is a Notable essay in Best American Essays 2012. Currently, she is the senior nonfiction editor of The Fiddleback, a literary journal, and lives in Colchester, Vermont.